Duct sealing can help create a much more efficient home and reduce heating and cooling costs. Homeowners spend a lot of time and money trying to improve their home's efficiency through methods such as insulation, furnace, and air conditioner improvements. While these are all worthwhile investments, too often homeowners forget about one key element: their ductwork. Your ducts are responsible for moving conditioned air throughout your home, and leaky, uninsulated ducts can have a significant impact on your home's efficiency and comfort. 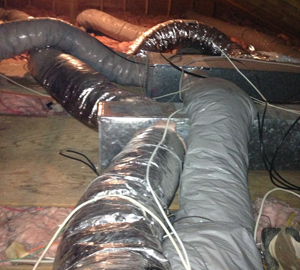 At Attic Systems, we can ensure your ductwork is properly sealed and insulated to maximize performance. Call us today for an estimate on ductwork services for your home! 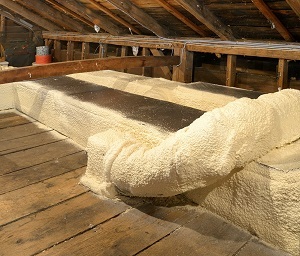 Uninsulated ducts in the attic are a major source of energy loss in many homes. These duct issues will cause problems such as uneven temperatures throughout the home, slow heating and cooling in the house, and high energy bills. Duct sealing: Leaky ductwork is one of the most wasteful duct problems. When the air you pay to heat or cool escapes through the ducts, your HVAC system will have to run longer to get your home to the right temperature, which can cost you a significant amount of money. By sealing gaps and joints in the ductwork, you can prevent air loss and help your system run more efficiently. Duct insulation: Exposed ducts in the attic are subject to the more extreme temperatures of the attic as opposed to the living space. This means that when your attic is cold in the winter, warm air from your furnance needs to pass through cold ductwork, which cools the air and forces your furnance to run longer to raise the home's temperature (the reverse is true in the summer). Duct insulation keeps your ductwork at a steady temperature, meaning the air moving through the ducts isn't affected and will change the temperature of your home more quickly. Duct cleaning: Dust, allergens, and dirt can all build up in your ductwork over time, which affects the air flow of your ductwork. These problems can aggravate allergy and asthma symptoms of the home's inhabitants while also making your home dusty. We provide complete duct cleaning to ensure you have clean indoor air quality and duct system that's operating efficiently. Attic Systems provides complete ductwork services for all your ductwork problems, helping make your home more comfortable and energy efficient. If you're interested in duct sealing, duct insulation, or duct cleaning for your home, call us today for an estimate!